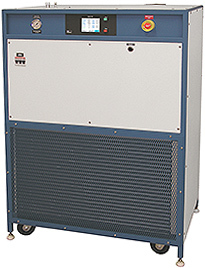 Mydax 1M16A1 Air-Cooled Chiller system used in Semiconductor test applications. Rated at 4.8 kW of cooling at 0°C. Mydax provides Quality, Reliability and Performance for Semiconductor Manufacturing and Test Process Cooling Chiller applications. Both refrigerated process cooling recirculating liquid chillers and non-refrigerated liquid to liquid heat-exchangers are used in semiconductor temperature control applications. 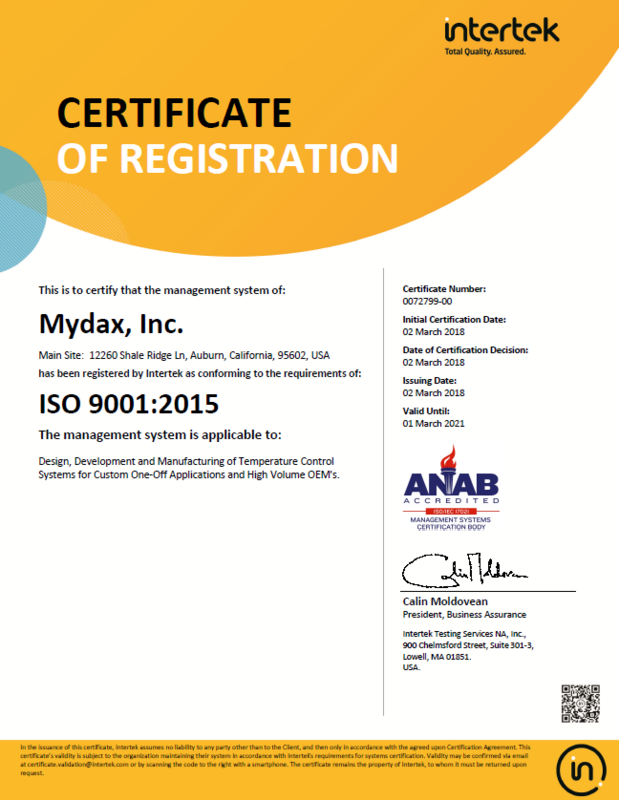 Mydax provides unmatched Quality, Reliability and Performance using Advanced Temperature Control technology. Mydax CryoDax Low Temperature Chiller series refrigerated chillers, spanning temperatures from -70°C (-94°F) to +150°C (+302°F) are an ideal match for applications for temperature control of Plasma Vapor Deposition (PVD) wafer processing. Mydax Air-Cooled or Water-Cooled chillers are also excellent candidates for the temperature control needs of semiconductor process cooling temperature control during manufacturing or component testing. Closed-loop non-refrigerated DI water or other fluid Heat Exchangers are excellent for isolating sensitive equipment from facilities water flow. These heat exchangers can maintain DI resistivity to a specified range and temperature to within +/- 0.1°C. Mydax builds units to meet the stringent requirements of Semi-S2, CE and UL. We can also manufacture products that are designed for international voltages. Mydax liquid chiller systems are used in Semiconductor process cooling applications at Micron, AMD, Intel, Chartered, Applied Materials (AMAT), Texas Instruments, Hitachi, LAM, Novellus, Fairchild, MEI, UMC, and other semiconductor “fab” fabrication plants around the world. Please call and discuss your application with our team of sales and design engineers.